Journal Reference: Romps D and R Öktem. 2018. 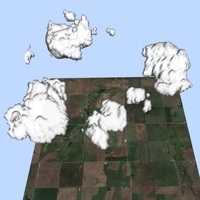 "Observing clouds in 4D with multi-view stereo photogrammetry." Bulletin of the American Meteorological Society, 99(12), 10.1175/BAMS-D-18-0029.1. Snapshot of the COGS 4D reconstruction of clouds over a 6-km-wide square domain centered on the SGP Central Facility. Shallow cumulus clouds – the cotton-ball clouds that drift overhead on partly cloudy days – are hard to observe and, therefore, hard to model and predict. By deploying a 12-km-diameter ring of cameras, these clouds are now being observed in fine detail using stereo reconstruction. Shallow cumulus clouds play a large role in cooling the Earth, so even small changes to their abundance as the planet warms could substantially ameliorate or exacerbate the warming. These high-resolution observations will allow scientists to test their theories for the behavior of these important clouds. Shallow cumulus clouds play a large role in Earth's current radiation balance, and their response to global warming makes a large and uncertain contribution to Earth's climate sensitivity. To develop accurate theories and parameterizations of shallow cloud cover, we need measurements of clouds' horizontal dimensions, their elevations, their depths, the rate at which they are created, the rate at which they dissipate, and how all of these factors vary with changes to the large-scale environment. Only observations that are high-resolution relative to individual clouds in all four dimensions (space and time) can provide these needed data.